Nanaimo, known as the Harbour City, is Vancouver Island's second largest city. Originally it was the site where five separate Native villages gathered together, a place called "Snenymo" which meant 'great and mighty people'. The area was first explored by the Spanish and later by Captain George Vancouver. 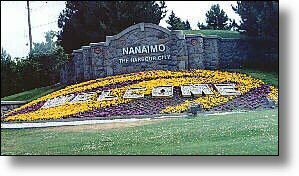 The discovery of coal in 1851, lured miners to the area and Nanaimo was incorporated in 1874 making it the third oldest city in BC. You can relive the past in the areas museums as well as a number of pioneer buildings and sites. Built literally and financially on coal, the city now supports a diversified economy, with tourism being a major contributor. The recreational opportunities in and around the city are boundless. In the city itself you can experience local history in the museums or find more about the Native peoples of the area in Georgia Park, thrill at the firing of the cannons at the Hudson's Bay Company bastion, or just wander through the preserved pioneer sites of the town. Perhaps a visit to Fisherman's Wharf for fresh seafood or a stroll through the various shops is more to your liking. For the outdoor enthusiast, the area in and around Nanaimo can offer you everything from hiking trails, a nature centre, bird sanctuary and picnic and swimming sites plus great fishing opportunities. You can access nearby Gabriola Island in BC's Southern Gulf Islands, via a ferry service that runs daily from downtown Nanaimo. 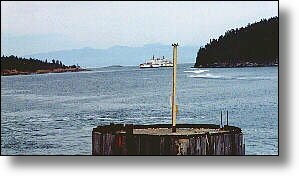 BC Ferries sail 16 times daily each way, a 5km/3mi, 20-minute ferry ride. A spectacular sight awaits the visitor in November to April when the waters around Nanaimo are teeming with sea lions and sea birds feeding on the spawning herring. Access: Nanaimo is 26 km (16 mi.) north of Ladysmith or 110 km (68 mi.) north of Victoria on Highway 1. It is served by BC Ferries from Horseshoe Bay (Vancouver); a crossing time of 1 hour and 35 minutes and from Tsawwassen it takes two hours. Regional airlines and bus service is available as is Via Rail. Local Attractions: Arboretum, Historic, Regional and Military Museums, Marsh Bird Sanctuary, Heritage Walk, Marine Biological Station, Wildlife Sanctuary, pulp mill tours, Waterfront Lagoon Esplanade, Fisherman's Wharf, Georgia Park, Swy-A-Lana Lagoon, Newcastle Island. 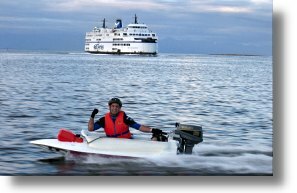 Accommodations: Visitors to Nanaimo, BC, can enjoy a wealth of tourist services and lodging choices. Visitors can stay in accommodations that include deluxe hotels, motels, bed and breakfasts or family-oriented resorts; private and provincial campsites are also nearby. 2290 Bowen Road, Nanaimo, B.C.